El Trebol Apartments Free Child Places Low Deposit Family Holidays @ Web2travel Deals. Finding the Best Value Holidays to Costa Teguise, Lanzarote from UK airports. 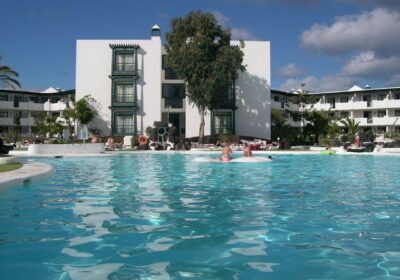 El Trebol Apartments, Costa Teguise, Lanzarote are also called SuneoClub HSA El Trebol by some Tour Operators. Great location in the middle of Costa Teguise, so you’re close to shops, bars and restaurants. Five minutes drive from Las Cucharas beach. Book Your Package Holiday Online Now with Top Tour Operator to claim your Free Child Place. The hotel is located just steps away from a number of local amenities, 1km from the beach, and 15km from Lanzarote Airport. The slide-filled shallow pool, night-time mini-discos and kids playground make the SuneoClub HSA El Trebol a top pick for Family Package Holidays in Lanzarote. The 3 star El Trebol Apartments, Costa Teguise can offer cheaper prices for family holidays than other properties that offer Free Child Places Lanzarote. The El Trebol Apartments offer comfortable accommodation at a great price, perfect for families looking to enjoy a fun-filled beach break. All guest rooms feature a private bathroom, air conditioning, TV, Wi-Fi, telephone, hairdryer, and a minibar. Further facilities include a currency exchange desk, parking, on-site laundrette, TV lounge, a children’s splash park, kid’s disco, and occasional entertainment. Dining facilities include an international buffet restaurant and two bars. Prefer Hotel Only or Flight Plus Hotel Deals? As this property is contracted to a Top Tour Operator, you are unlikely to be able to book Hotel Only or Flight Plus Hotel during peak holiday dates. You may find availability at other times. Try the Sunshine link below.